Springwell Senior Living in historic Mt. 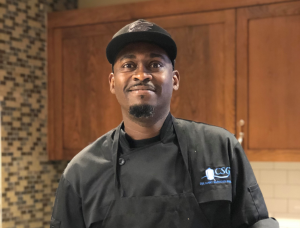 Washington is pleased to announce that Gerard Campbell has been named new chef manager of The Homestead, Baltimore’s newest Independent Living community. Campbell, a former executive chef at Miss Shirley’s on Pratt Street and in Roland Park, will be in charge of the upscale dining program for residents. Before joining The Homestead, Campbell had also served as sous chef at the Tremont Hotel and Hyatt Baltimore. The all-new Homestead, now open, is a 142,000-square-foot state-of-the-art community featuring 99 well-appointed residences ranging in size from a one-bedroom one-bath to a two-bedroom two-bath corner apartment, some with balconies or patios with beautiful park views. Common areas include a Library, Courtyard, Pub, Living Room, Dining Room and Education Center. The Homestead offers full service amenities, incomparable hospitality, and daily planned activities for every interest. Campbell graduated with an Associate of Arts Degree from the Baltimore International Culinary College.